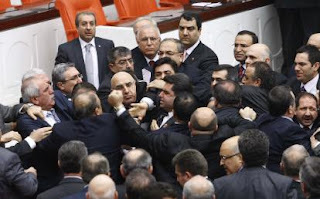 Turkish Politics in Action: "Fight!" Prime Minister Recep Tayyip Erdoğan mentioned in a televised interview Sunday that his wife had been denied entry to a military hospital, the Gülhane Military Medical Academy, or GATA, three years ago when she tried to visit actor Nejat Uygur while wearing a headscarf. Erdoğan said his wife Emine Erdoğan wanted to visit Uygur in the hospital and that Uygur’s wife had said they would be honored by the visit. Uygur’s wife then informed hospital officials of the intended visit but the latter said GATA could not allow Erdoğan to enter because of her headscarf. Durmuş’s words drew a fierce reaction from AKP deputies, including Erdoğan, leading to a fistfight between AKP and MHP deputies. Some deputies were slightly injured while one deputy was hospitalized. Taking the floor for the second time, Durmuş recalled one of the AKP member’s earlier remarks describing Erdoğan as the second prophet. On the floor, Erdoğan said: “First of all, our friends don’t know that the chain of prophecy ended with our last prophet [Mohammed]. And, you also lacked intelligence as to defend those who didn’t let her enter GATA. Nobody who attributes such an adjective to me can keep their place in our party. You cannot insult my wife. This is crude and immoral." On Wednesday, Eser resigned from the party. AKP Deputy Prime Minister Bulent Arinc followed the series up with a visit to acting CHP parliamentary speaker Guldal Mumcu's room, criticizing Mumcu for not keeping better control of the session. Mumcu and the CHP then complained about executive meddling in parliamentary affairs. Erdogan followed the incident up with accusations that the MHP and the CHP are one in the same. The MHP worked with the AKP in February 2008 to pass a constitutional amendment paving the way for women to wear the headscarf in universities in a limited fashion. That amendment was later annulled by the Constitutional Court, but speaks to MHP's efforts to make inroads among the conservative voters that have been attracted to the AKP over the issue. In another interesting development, the Turkish Armed Forces' Chief of General Staff Ilker Basbug has said that he regrets Ms. Erdogan was denied entrance to the military hopsital, calling the incident "unfortunate." Today's Zaman columnist Fatma Disli Zibak considers whether Basbug has softened his position on the headscarf issue. And, for another take, Nicole Pope wonders how children can be tried as adults for offenses she considers similar to those modelled by MPs. While politicians behave like kindergartners in Parliament and get away with it, it is somewhat ironic -- and tragic -- that real children, the ones you would expect to get into scraps, are being tried as adults in courts around the country on terrorism charges for taking part in protests. Stone throwers are not the only teenagers targeted by the judiciary. Three minors face jail sentences in Bursa after being charged with “insulting the prime minister” by referring to him as “lightbulb Erdoğan.” The court based its decision on a definition of the word “lightbulb” provided by Google, and deemed it insulting. There is a link between the unedifying sight of grown-up men charging at each other, broadcast across the country, and the detention of young people. Such scenes carry consequences: they ratchet up the tension and increase polarization in society. Perhaps an R rating for bad language and the use of violence should apply to political discussions. Is it surprising that teenagers, with the idealism and enthusiasm that characterizes the young, should express their views in ways that are sometimes extreme and misguided when confrontation is the norm in the political arena? UPDATE I (2/9)-- The three students facing jail sentences for the "lightbulb" statements to which Pope alludes hale from Bursa, where another student sentenced last year for making the same remark. Citing Google, the Bursa court in that case ruled the student was not in his rights since the remarks constituted an insult and could not be considered legitimate political speech. Though not children, members of parliament have immunity from such charges, or from breaking into fistfights, which is not an altogether extraordinary event in Turkey's Grand National Assembly. UPDATE II (2/11) -- Arinc has apologized for some of the comments he made to Mumcu after saying earlier he would apologize if she wanted him to, though he would stand by the correctness of his criticism. Also, President Gul, while on a state visit in India, urged the media not to cover controversies occuring between politicians so as to not increase the social tension they produce. Politicians can sue each other for insults though. Here's a search.